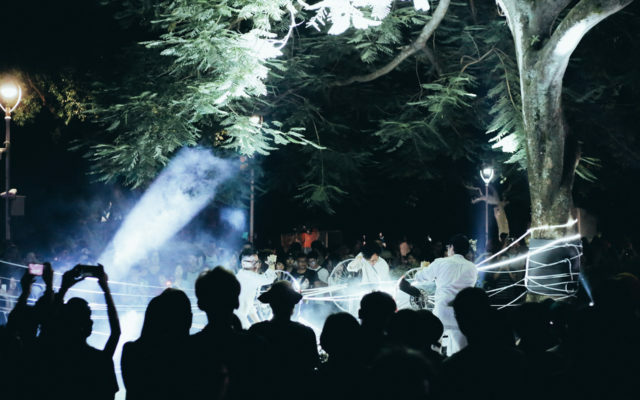 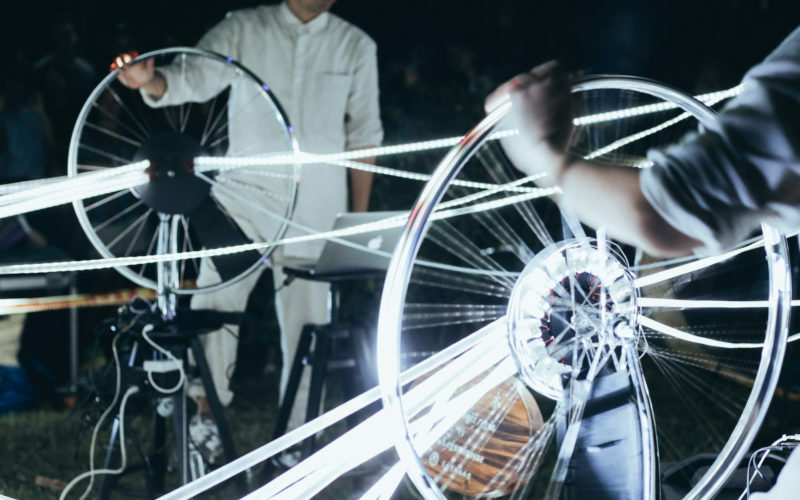 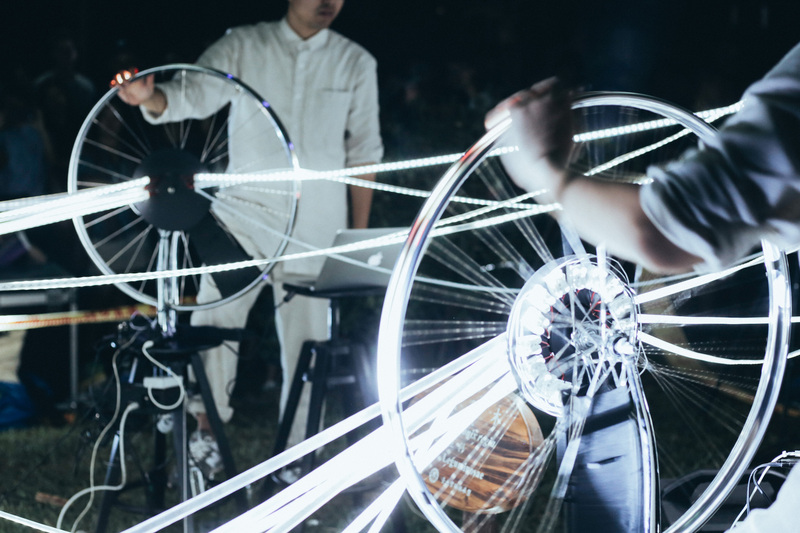 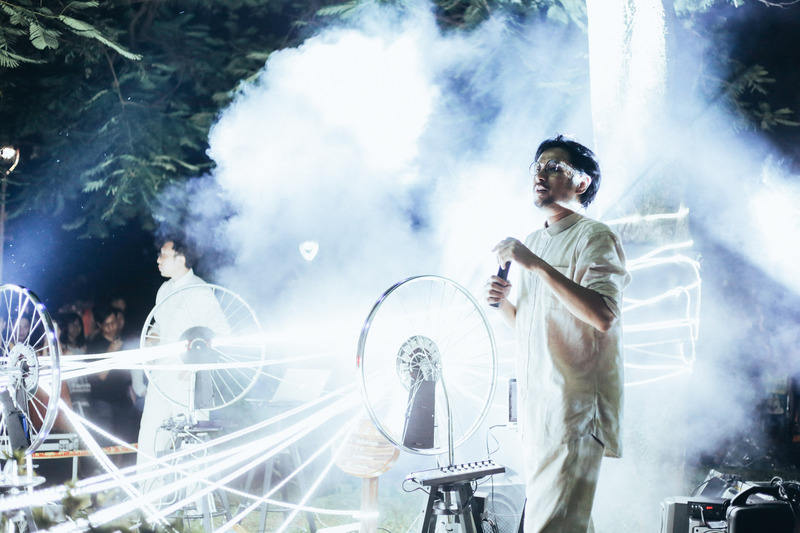 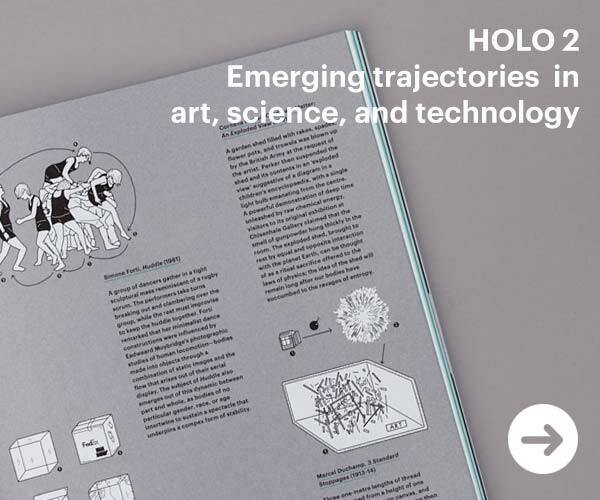 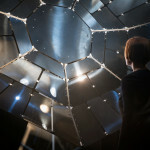 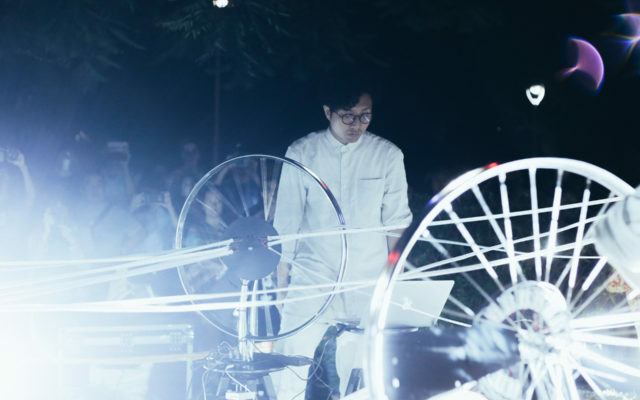 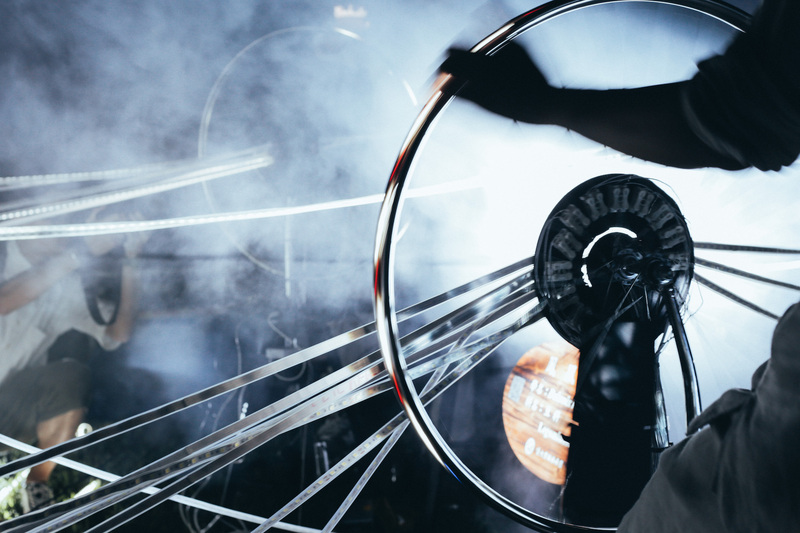 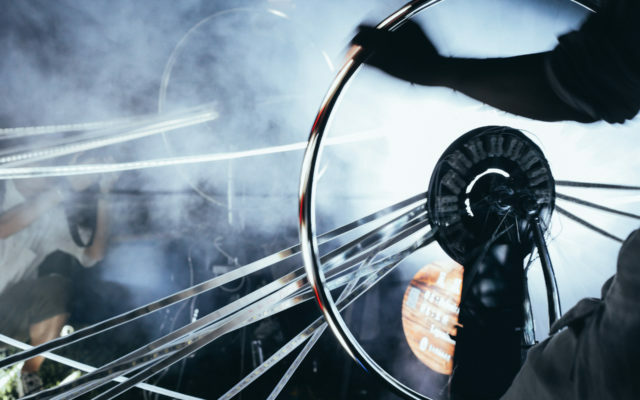 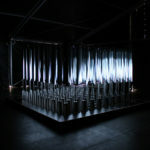 Created by Hong Kong based Keith Lam, Seth Hon and Alex Lai, “Cycling Wheel” is an installation and performance that borrows the concept of Marcel Duchamp’s Bicycle Wheel and re-imagines it as a dynamic and interactive performative instrument, transforming its mechanics into sound and light. 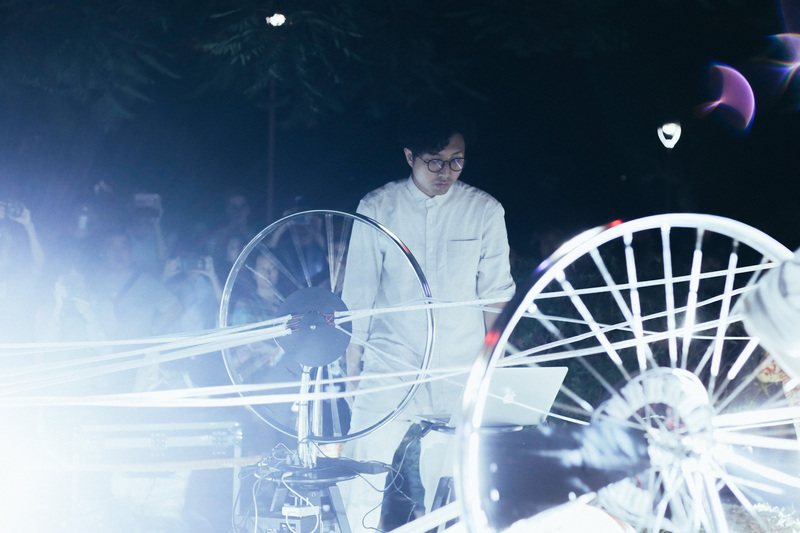 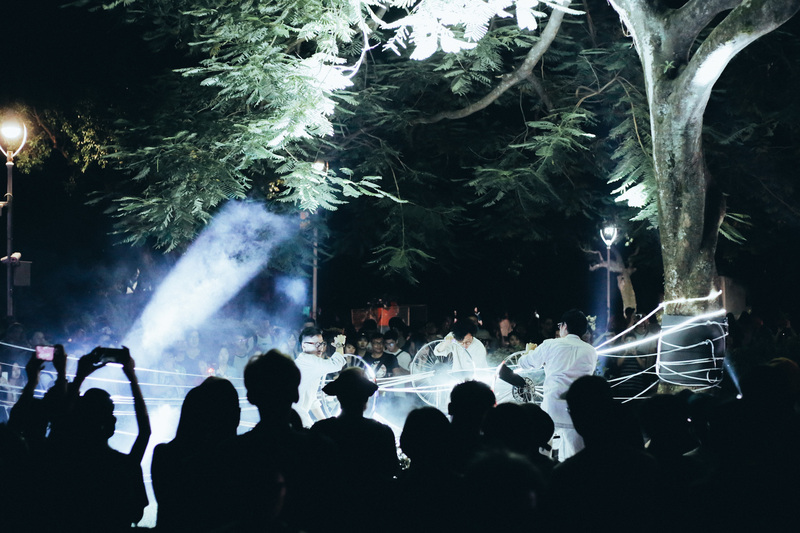 The performance took place on October 7th 2017 at Nuit Blanche Taipei / Taiwan. 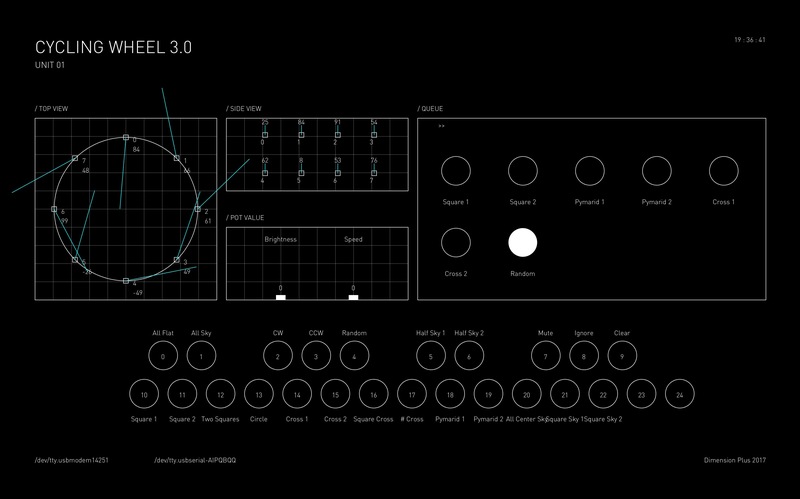 ↑ Unit01 user interface created in Processing and running on a Mac Book Pro. 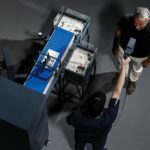 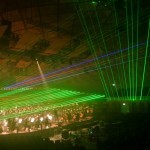 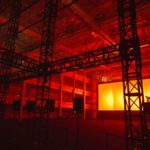 Technical setup includes tailor made control panel software created with Processing, and three different units, each controlling music, light beam and led strips. 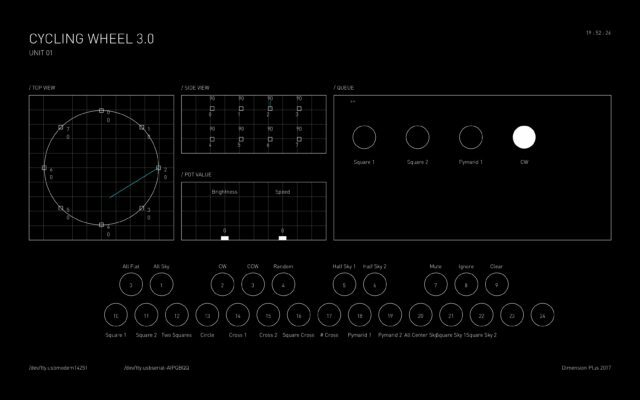 Unit00 (music) includes a Mac Book Pro, Korg nanoKONTROL2 – Slider, Arduino Leonardo, DMX Controller, DMX Decoder, UNIT00 Software, Ableton Live and MOTU Audio Interface. 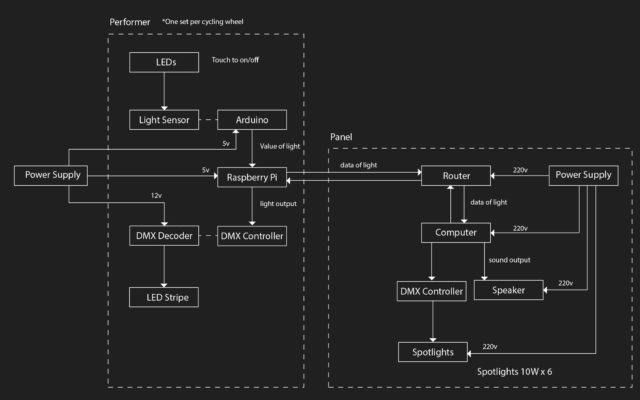 Unit01 (light beam) includes also a Mac Book Pro, Korg slider, DMX controller and decoder, Arduino Uno and UNIT01 Software. 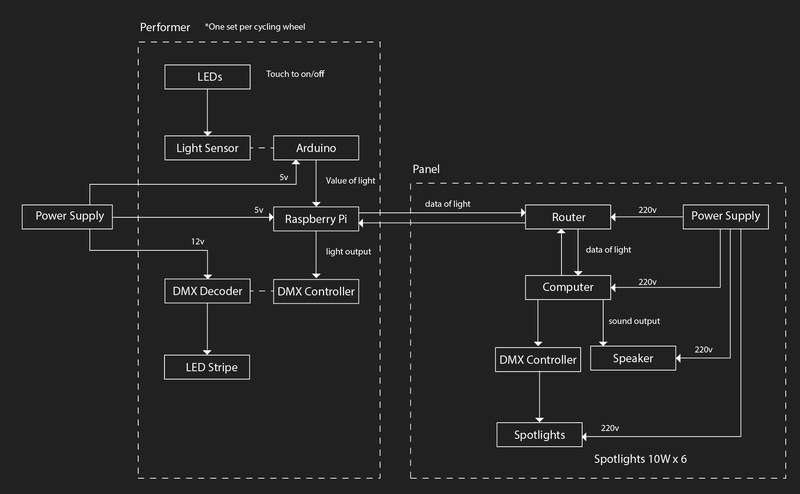 Unit02 (led strips) runs a Raspberry Pi, DMX Controller, DMX Decoder and UNIT20 Software. 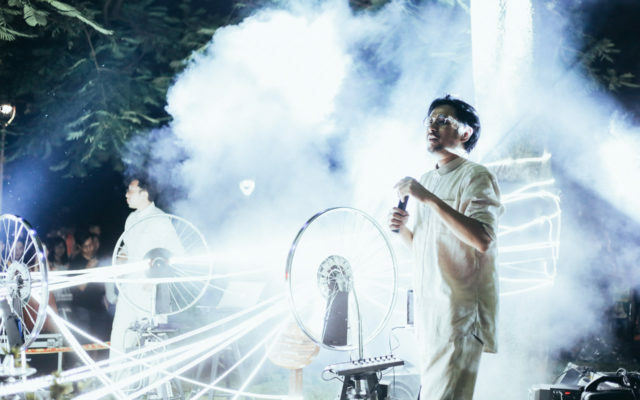 Credits: Keith Lam, Seth Hon (Artist, Creative Coding), Keith Lam (Music), Keith Lam, Seth Hon, Alex Lai (Performance), Vision Tech (H.K.) 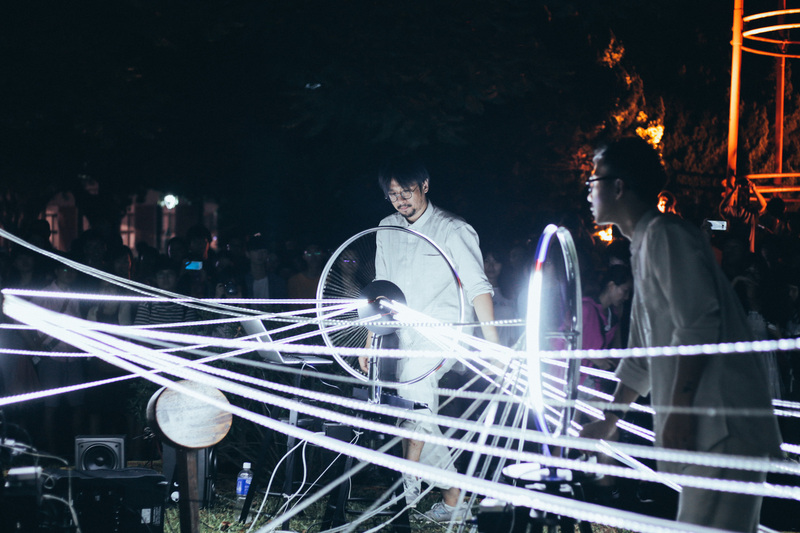 Ltd (Lighting Equipment), Karl Ma (Project Manager) with special thanks to Hippo Yim, Nuit Blanche Taipei and Dimension Plus.